The e-cigarette tank is an accessory that resolves one of the most common problems faced by owners of large e-cigarettes such as the Halo Reactor or VaporFi VOX II. With these large e-cigarettes, so much vapor is produced that you would need to refill a standard attachment such as a cartomizer or dripping atomizer several times each day. This makes it necessary to bring a bottle of e-liquid if you’re going to be out of the house for a while. An e-cigarette tank greatly increases your e-cigarette’s capacity for e-liquid and requires refilling much less frequently. In addition, e-cigarette tanks feature replaceable atomizers that cost very little per unit. Since e-cigarette tanks are both very functional and very economical, most of the people who use larger e-cigarettes seem to prefer them. The typical components of a modern e-cigarette tank. Left to right: mouthpiece, glass enclosure, pre-built atomizer, fully assembled tank, rebuildable atomizer top, RBA base, tank base. Update for 2016! When I originally wrote this article, the term “e-cigarette tank” actually meant something different than it does today. Originally, the term referred to what we now call a “cartomizer tank” — a tank enclosing a standard cartomizer with holes punched in the side. Modern e-cigarette tanks work much better than cartomizer tanks, so cartomizer tanks are now rarely used. You’ll find the original content of this article at the bottom. Otherwise, join me as we explore modern e-cigarette tank systems. I’ll explain how e-cigarette tanks work, discuss how to troubleshoot them when they go wrong and point you in the direction of what I believe are the best e-cigarette tanks currently on the market. An e-cigarette tank has a glass enclosure and a replaceable atomizer. The atomizer typically has holes on its sides, exposing a wick that allows e-liquid to travel from the tank to the heating coil. Vapor travels through a tube from the atomizer and exits through the mouthpiece. An e-cigarette tank has a base section that unscrews from the glass enclosure, allowing you to refill the tank or replace the atomizer easily. The base section usually has an airflow control as well. If you use the maximum airflow setting, you can inhale vapor directly to your lungs. Alternatively, with tighter airflow, you can inhale from your mouth to your lungs. Modern e-cigarette tanks feature superior vapor production and hold enough e-liquid to last several hours between refills. Replacement atomizers usually cost about $2-3, making e-cigarette tanks very economical as well. Because e-cigarette tanks tend to produce so much vapor, many people find that switching to a tank system enables them to begin buying e-liquids containing less nicotine. What Are the Best E-Cigarette Tanks? The VaporFi Volt Hybrid Tank is an upgraded version of the popular Kanger Subtank Mini, featuring a more leak-resistant design and widened holes for e-liquid flow. This wonderful e-cigarette tank has the ability to use pre-built coils or a tiny rebuildable atomizer. The package includes two pre-built organic cotton coils and two pre-wrapped RBA coils, giving you a chance to try every possible configuration and choose your favorite. Although I’ve tried many different e-cigarette tanks, the VaporFi Volt is the one that I keep returning to. I haven’t found a better balance of reliability, vapor production and flavor quality to date. The Freemax Starre — also known as the Halo Reactor tank when sold by Halo — is the best e-cigarette tank that I have used to date in terms of pure vapor production. With its very wide atomizer component and large e-liquid holes, the Freemax Starre has no problem feeding e-liquid to the coil consistently even at high wattage settings — and the vapor production is astronomical. If you prefer your vapor clouds large and hot, and don’t mind compromising a little on flavor quality, the Freemax Starre is an excellent choice. The Aspire Nautilus Mini is a slightly older tank than the two others on the list. It doesn’t quite hold as much e-liquid and isn’t sub-ohm capable. So, the vapor production is a bit lower, but that also means that you won’t go through your e-liquid as quickly with the Nautilus Mini. However, the Nautilus Mini probably has the best overall flavor quality of any e-cigarette tank I’ve used to date. The Nautilus Mini is also the best e-cigarette tank for mouth-to-lung inhaling, if that’s what you prefer. It also works well for direct-to-lung inhales, though. All modern e-cigarette tanks are very similar in design. You’ll hold the tank upside down and unscrew the base from the glass enclosure to refill the tank or replace the atomizer. If you’re refilling, simply add e-liquid from a bottle until the tank is mostly full, avoiding the center hole. To replace the atomizer, twist the old atomizer out and twist in a new one. When replacing the atomizer in an e-cigarette tank, it’s a good idea to add a few drops of e-liquid directly to the cotton before reassembling the tank. This helps to ensure that your first puff won’t singe the cotton. If the atomizer’s wick burns, the vapor will never taste right. Wait a few minutes to allow the e-liquid to saturate the wick fully, and you’re ready to go. The flavoring agents that many e-cigarette users prefer can leave residue or “gunk” on the coil — it’s time to replace this one. As you use your e-cigarette tank, you’ll need to replace the atomizer periodically. How often you’ll need to do this will depend on a number of factors including the type of e-liquid that you prefer, the wattage at which you use your device and whether or not you allow sufficient time between puffs for the wick to fully saturate. 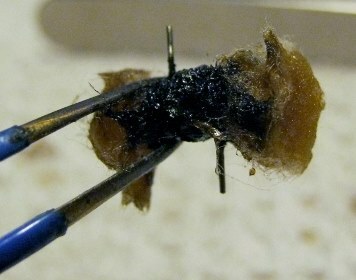 Heavily flavored or sweetened e-liquids will tend to leave deposits that collect on the coil and wick. After a while, you’ll start to detect some “off” flavors because the deposits will burn, rather than vaporize. Depending on all of these factors, you’ll need to install a new atomizer every couple of days — or perhaps every few weeks. Sometimes, you might notice a bit of gurgling when using your e-cigarette tank. You might also feel hot droplets hitting your tongue. This happens because some of the vapor condenses inside the tank’s air tube, eventually forming larger droplets that settle on top of the coil. You can help to prevent this from happening by occasionally running a cotton swab or piece of paper towel down the air tube to soak up excess e-liquid. NOTE: Cartomizer tanks are no longer as popular as they were when this article was originally written. I have preserved the original content of this article below, but I do not recommend buying this older style of e-cigarette tank today. The Tube Tank by Volcano is a good example of a cartomizer tank. It’s available in two sizes, holding either 4 or 7 ml of e-liquid. It’s also available in a low-resistance version for single-voltage e-cigarettes and a high-resistance version for variable-voltage e-cigarettes. It starts at $16.99. Is it actually worth your while, though? In this article I’ll explain the basics of the e-cigarette tank and help you come to your own conclusion. The image above details the process of filling an e-cigarette tank. To fill one, pull the cartomizer straight down until you can drip e-liquid from a bottle into the tank’s reservoir. Do this until you’ve got a good amount of e-liquid in the tank and push the cartomizer back up. Fill the cartomizer as you would any standard Boge-type cartomizer, pop on a drip tip and go. The picture suggests filling the cartomizer directly from a bottle, but I prefer to use a syringe or needle tip bottle to inject the e-liquid directly to the bottom of the cartomizer. You only need to go through this complicated process the first time you fill your e-cigarette tank and again each time you buy a new cartomizer, which you’ll probably need to do about once every month. While you continue to use the original cartomizer, you can refill the e-cigarette tank periodically by pushing the cartomizer down and adding e-liquid directly to the tank. You should only buy an e-cigarette tank from a company that allows you to select the resistance of the cartomizer because one resistance definitely isn’t appropriate for all e-cigarettes. A low-resistance cartomizer allows an e-cigarette that operates at 3.7 volts to produce the most possible vapor. If your e-cigarette doesn’t have stacked batteries and doesn’t allow you to adjust the voltage, it operates at or near 3.7 volts. Buy an e-cigarette tank with a low-resistance cartomizer. Low-resistance cartomizers don’t work on most variable-voltage devices above around four volts, however. For this reason, good e-cigarette companies also offer e-cigarette tanks with high-resistance cartomizers. An e-cigarette tank with a high-resistance cartomizer operates at up to six volts with no problem. As I mentioned above, you’ll need to replace the center cartomizer in your e-cigarette tank periodically. You’ll know it’s time to do this because the vapor production will start to drop or because nothing will happen when you push the activation button on your e-cigarette. Some people have reported getting a burned taste when using an e-cigarette tank. This can happen because you’re using a low-resistance cartomizer and the voltage on your e-cigarette is set too high. It can also happen because the e-liquid in the cartomizer isn’t reaching the heating coil, which is why I suggest filling the cartomizer with a needle. There may be some cases, though, when no amount of troubleshooting will stop your e-cigarette tank from producing a burned taste. This happens because the hole drilled into the side of the cartomizer is too small, preventing e-liquid from feeding through from the tank. Unless you have the equipment necessary to expand the hole yourself, you’ve got a faulty product and should return the cartomizer to the vendor for a replacement. Should I Buy a Cartomizer Tank? I’ve owned two Volcano Tube Tanks and believe it is an excellent e-cigarette tank. It produces an excellent amount of vapor and holds enough e-liquid to last at least a day, if not several days. However, it has two drawbacks compared to a standard cartomizer or atomizer and drip tip. The first is flavor purity; I feel that an e-cigarette tank mutes the flavor of an e-liquid slightly, making the details less apparent. I also feel that an e-cigarette tank cartomizer can sometimes have a very tight draw. Both of these problems may stem from the fact that e-cigarette tank cartomizers are longer than tank cartomizers, which may impede airflow slightly. The extra e-liquid storage offered by an e-cigarette tank is an excellent value proposition. If you’re looking for the utmost in flavor purity, though, your purchase might result in disappointment.